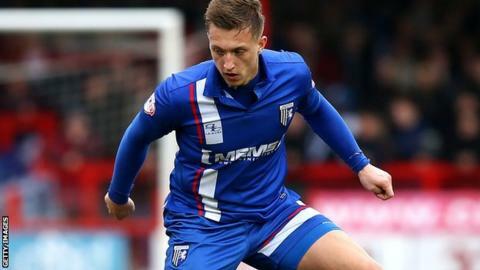 Gillingham striker Luke Norris could be out for another 10 weeks with the ankle injury he sustained in the victory over Crewe on 17 October. The 22-year-old has scored three goals in 15 appearances for the League One leaders this season. "He's taken a part of the ligament off the bone," Gills boss Justin Edinburgh told the club website. "It's a big injury and a blow to us. He's a pivotal part of the success we have had so far." Edinburgh has spoken to chairman Paul Scally about the possibility of making a loan signing to strengthen his squad while Norris is sidelined. "I think we've missed him in the last couple of games," the 45-year-old added. "We are looking into the market but it needs to be the right personnel that come into the group because the dynamics and chemistry are good."